Senator Schumer’s compromise plan to reopen the government at the expense of DREAMers is unacceptable. 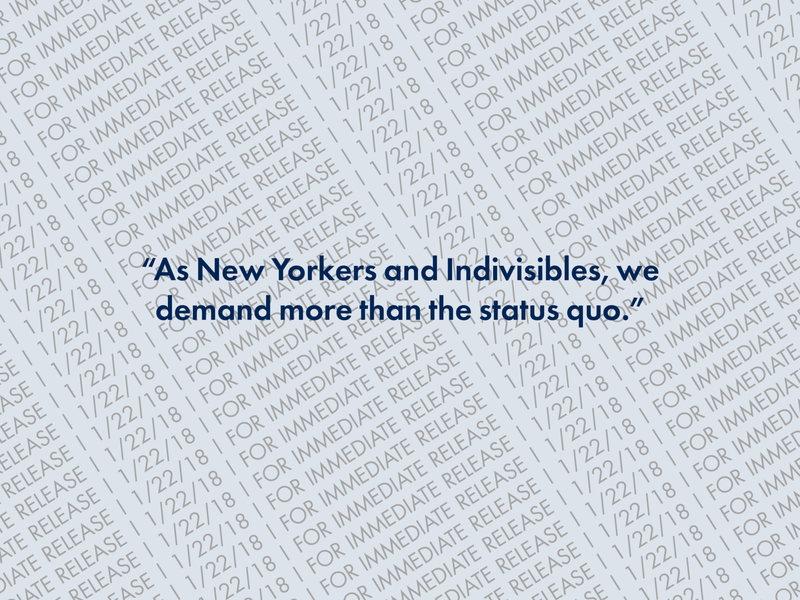 As New Yorkers and Indivisibles, we demand more than the status quo. While we hope for fair consideration from House and Senate Republicans, we do not expect it. In abdicating their responsibility to oversee an executive branch that is advancing white supremacy, Republican leadership should not be trusted, but forcefully opposed. In comments today immediately after Senator Schumer’s speech, Senator McConnell referred to a Democratic “strategy to shut down the government over illegal immigration.” This, of course, is simply not true. Bad faith abounds: we remember the “promise” made to Senator Collins during the ACA and tax debates. Even if the Senate passes its own DACA bill, an agreement with the House over an acceptable bill is uncertain. In addition, the President’s unwillingness to compromise, which brought us the Trump Shutdown, is a factor that can present chaos at any moment. We thank Senator Gillibrand for voting today against limiting debate on this issue. Senator Schumer deserves credit today for securing six years of CHIP funding. Democrats remain responsible, however, for seeing through passage of a clean DREAM Act. No DREAM, No Deal. If there is no DREAM Act by February 8th, we will hold him accountable. We also demand resources for those recovering from disaster. At this moment in history, our most vulnerable Americans deserve protection, and democracy itself is at stake. We are watching, Senator Schumer, and our constituent power is close at hand. We use the Indivisible Guide to defend New York against the Trump administration and those in our state government that enable its harmful policies.